If your Facebook and Twitter feeds are anything like mine, you’re no doubt already aware of the rather unfortunate August 27th column in the Washington Post penned by small-business owner Casey Ark headlined “I studied computer science, not English. I still can’t find a job.” In it, Ark laments that the degree he received at Penn State failed to prepare him for employment in the real world. Despite diligent studying, the only real-world business skills I’d learned at college were how to write a résumé and operate three-fifths of the Microsoft Office suite. As someone fairly well-immersed in the world of academic computer science*, Ark’s piece didn’t seem to reflect any of the things I know about that community. And, as evidenced by my Facebook feed, I wasn’t alone. The piece spawned a lengthy comment thread on the Post site in which it was noted that Ark’s degree isn’t actually in computer science but rather in Information Systems (a business degree), as well as other responses including a Reddit thread and a blog post by UMass Amherst CS Professor Emery Berger featuring comments from a number of other CS colleagues and urging the Post to remove the column because of the inaccuracies it contains. And that seems a reasonable request. But I can see why the Post ran the piece in the first place. From the Post’s perspective, it’s a great contrarian anecdote (if it were accurate) to the prevailing narrative that STEM education ought to be a national priority for policymakers — a case CRA has played a role in making. And Ark could have made it a bit more compelling if he cited economists and labor analysts, as the Post did in this Sept 1st article, who argue that the data show no need for additional graduates in many STEM-related fields. So it’s worth trying to delineate a response to this case as well, I think. The confusion, I believe, comes from conflating “computer science” or “computer engineering” with STEM overall. The demand for STEM workers is not uniform across all disciplines. Code.org Founder Hadi Partovi has a fairly detailed post on this subject, but the upshot is that computer science (broadly defined) drives 60 percent of all new jobs in the STEM fields. 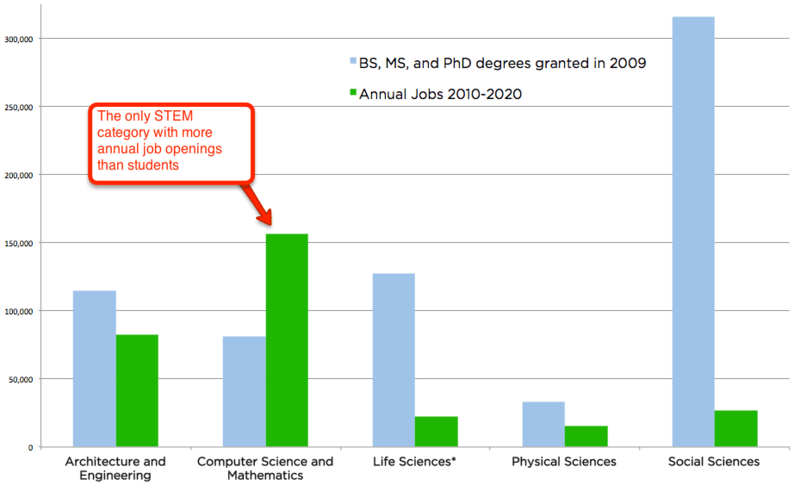 Indeed, computer science is the only STEM field in which there are more jobs than students. So Salzman and others may be right that, in total, STEM disciplines may be oversubscribed, but that’s not the case in computing. That’s what really made the inaccuracies in Ark’s column jump out to those of us in the community. Graduates in CS, especially graduates at the tops of their classes, are in high-demand — not just in the tech sector, but across the economy, across every industry from banking to to defense to health care to manufacturing. And it’s not just because they know how to use the other two-fifths of the Microsoft Office suite…. *and also an English major — double-whammy! 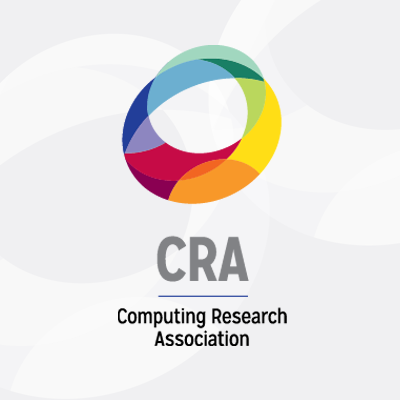 New Look for CRA Unveiled at the 2014 CRA Conference at Snowbird Computing Researchers Go To Washington!